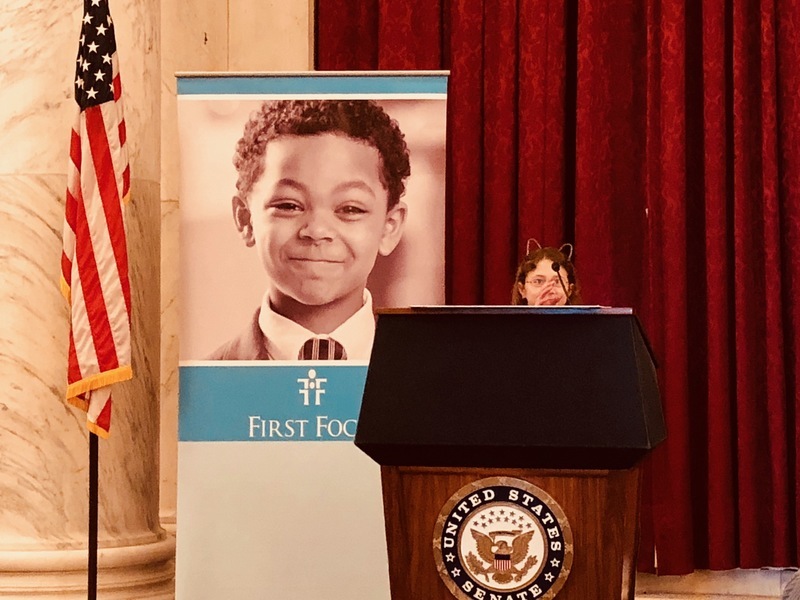 Eleven year old Harmonie from Texas was only a hair taller than the podium, but stepping up to the microphone at a December 19 briefing, she delivered a powerful message to Congress: extend federal funding for the Children’s Health Insurance Program (CHIP). Harmonie is among the nine million kids nationwide who count on CHIP, together with 300,000 pregnant women. Despite helping struggling families like hers afford children’s medical and dental coverage, CHIP has been in jeopardy since Congress let its funding lapse on September 30. Opening up about her vision disorder that requires costly treatment, Harmonie said, "I depend on CHIP. And if it’s taken away, I won’t be able to see the whiteboard that my teacher writes on every day. I won’t be able to learn." Harmonie’s story, together with the voices of families, advocates and concerned constituents nationwide, began to sink in with Congress later in the week. On December 21, lawmakers finally turned from the tax bill to a stop-gap spending measure to avert a government shutdown. The legislation, signed by the president this morning, extends CHIP through March 2018. Unfortunately, short term fixes will not be enough to provide the stability that states and families need. In fact, new data released this week from the Georgetown Center for Children and Families suggests nearly two million children could lose coverage in the first quarter of 2018 without stable federal funding for CHIP. The Children’s Dental Health Project joined letters to congressional leaders and released a statement with seven national partners pressing Congress to pass a five year renewal rather than another short-term patch. At the congressional briefing, fear of losing coverage over insufficient congressional action was palpable. Families from Colorado, Kentucky, New York, Utah, West Virginia and Wisconsin implored lawmakers to fund CHIP for five years. Angelique Smith from Colorado shared that CHIP has ensured her five year old son gets the care he needs to be healthy and thrive. A single working mom, she earns too much to qualify for Medicaid but cannot afford private insurance; with CHIP, she can care for her son’s health needs without eroding her family’s economic security. Aware that Colorado has already sent notices warning that the state’s CHIP program will end on January 31 absent Congressional action, she urged Congress to approve CHIP for at least another five years. "I depend on CHIP. And if it’s taken away, I won’t be able to see the whiteboard that my teacher writes on every day. I won’t be able to learn." In addition to Colorado, other states like Virginia, Connecticut and Alabama have warned their CHIP programs may shut down or freeze enrollment in early 2018 without long-term funding. So while many people may enjoy the holidays without the disruption of a government shutdown, families who count on CHIP will continue to fear the possibility of their state’s CHIP shutdown. As the Georgetown Center’s report indicates, to keep their CHIP doors open, states need more certainty than a two or three month cash infusion can provide. The coming weeks will reveal whether the latest funding patch will be enough to keep kids like Harmonie and Angelique’s son covered. But rather than waiting to see what happens, those of us who care about the nine million children and thousands of pregnant women in need of CHIP coverage can use this critical time to continue speaking out. Each of us can lift up CHIP’s value by contacting our own members of Congress by phone, through email, and on social media. Tell your U.S. representative and both of your U.S. senators that funding CHIP for five years must be their first priority in the New Year. Find more resources to take action on CHIP in CDHP's toolkit, "Why Dental Coverage Matters," at cdhp.org/toolkit.